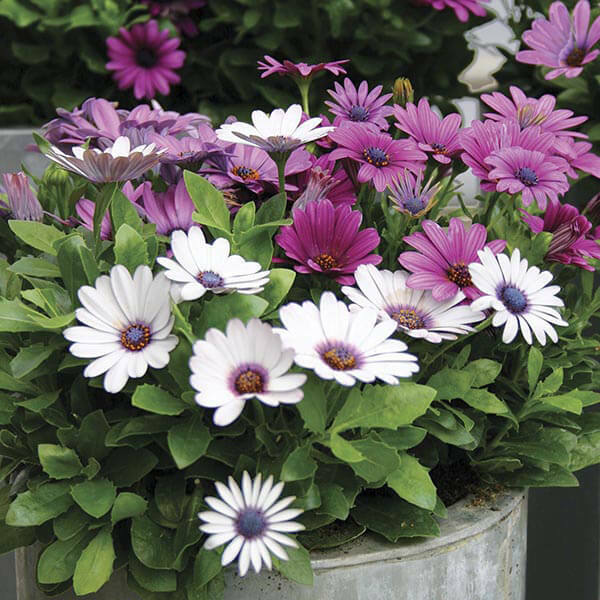 Osteospermum is an evergreen, perennial dwarf shrub with large, purple, daisy-like flowers with deep-blue centers, borne from early spring to late summer. The heads are on 15 – 20 cm long stems and have a diameter of 5 to 8 centimeters. The bracts are 13 – 16 mm long and glandular. The rays are white above and reddish blue below. The disc is dark blue or purple. The fruit surface is net-wrinkled. Common Names: Cape marguerite, African daisies, Van Staden’s river daisy, Sundays river daisy, white daisy bush, blue-and-white daisy bush, star of the veldt. It thrives best in bright light. The blooms close up at night and don’t open during cloudy or overcast weather. It grows well in humus-rich, moist but well-drained soil or a peat based soil is best, 2 parts peat and 1 part perlite or sand is a good mix. It prefers ideal temperatures of 60ºF – 65ºF / 15ºC – 18ºC. Water moderately but consistently during the growing season, Keep the soil moist but not soggy. Allow the top one inch of soil to dry out between waterings. During the winter reduce watering to a minimum. Fertilize every two weeks in summer with a balanced liquid fertilizer diluted by half. It can be easily propagated by cuttings. Take cuttings in spring or early summer. 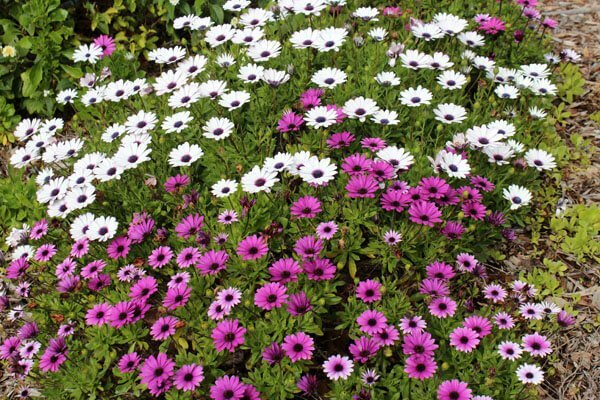 Sowing from seeds is the simplest and fasted method to propagate your osteospermum. Sow in a sheltered place anytime in March or April and cuttings are possible in summer. It has no serious pest or disease problems. Watch for aphids and downy mildew. Planting Man helps you to build beautiful & healthy gardens. We providing solutions for all gardening problems. Expert in Indoor plants, Outdoor plants, herbal gardens & fruit gardens.